Imagine the setting: you’re waiting on a nightclub-esque line to enter Rafael Cennamo‘s couture presentation at New York Fashion Week. At long last, the line starts moving, and you enter a small, dark room lit up only by the sparkling gold of the models’ opulent gowns. You bump into the lady in front of you, because she stops dead in her tracks at the sight of the collection. Before you can even get mad at the collision, you’re struck by the same sight, and you just get it. 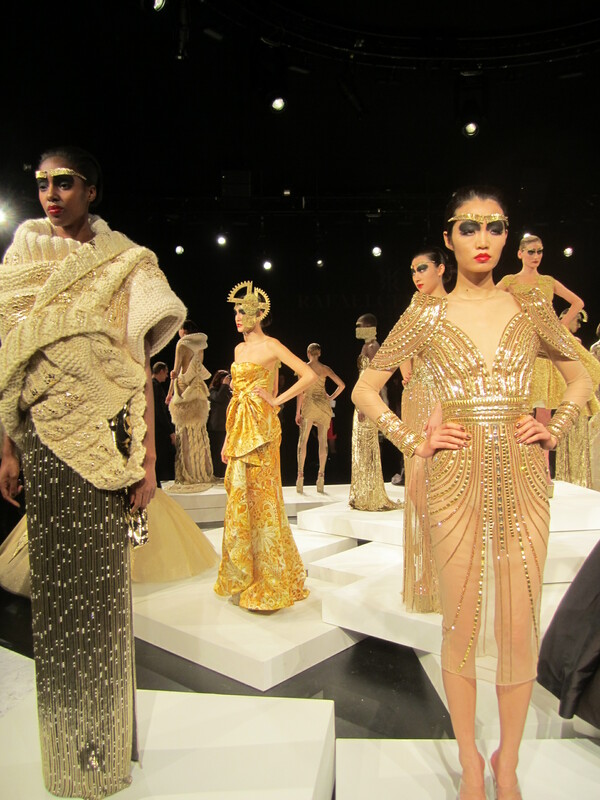 Check out these jaw-dropping pics from Fall 2013 New York Fashion Week! The theme of Rafael Cennamo’s Fall 2013 collection was “21 Shades of Gold.” As you can tell by seeing even a couple of these stunning looks, this goal was definitely reached. Each look radiated with at least ten separate shades of the richest golds ever seen. And of course, no gold collection would be complete without some actual metal. Bold gold metal eyebrows, reflective belts, and clock gear headpieces donned just enough of the models to make a serious statement without looking too costume-y. (Though of course, these gorgeous gowns are surely costume-worthy.) 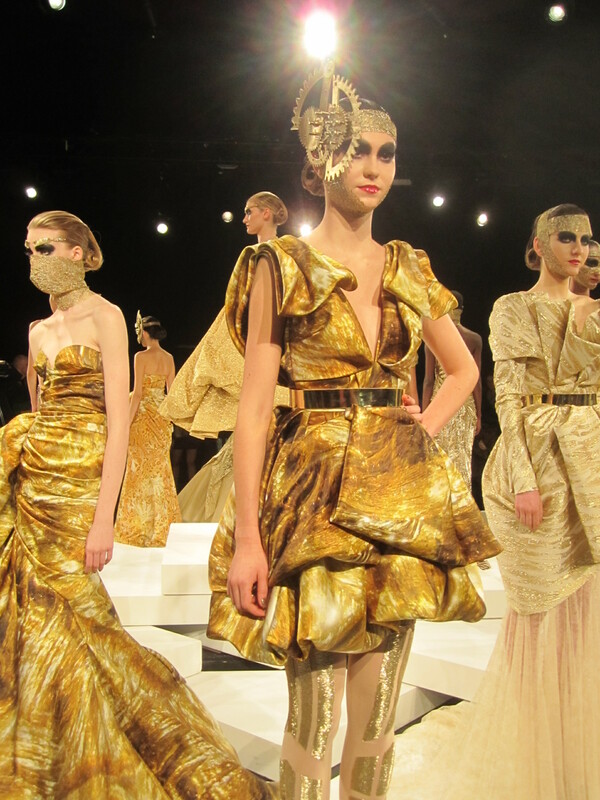 Sky-high gold + lucite heels made the models look like sculptures! Though the collection’s focus was clearly red carpet wear, several wearable pieces emerged. Luxe gold-threaded sweaters and paneled leggings would look as great dressed down as they did as accents to the couture looks. These statement looks are all about the details: from structured shoulders to impeccable beading work, time and the designer’s obvious expertise are everywhere you look! I wouldn’t be much of a makeup junkie if I didn’t mention that the makeup for the show was done by MAC and the swirly manicures (in shades of gold, of course!) were done with custom shades by Zoya. Odds are, you’re probably not about to rock black eyeshadow up to your brows with red lacquered lips and metal eyebrows, but the dramatic looks offer some great inspiration for looks. Touches of metallics are always great for the fall/winter season, as they keep your look from being flat and pale. If these looks don’t inspire you to try out some sparkle anywhere in your wardrobe, I don’t know what will! These photos are breathtaking! I can only imagine this show live. Thanks for sharing this magnificient story.